Hi friends. 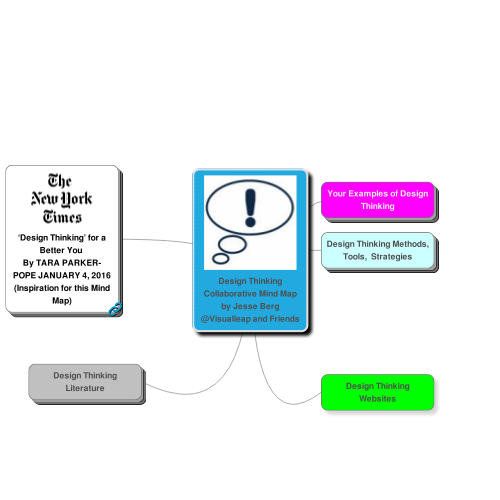 One of my big goals of this blog is to create collaborative Mind Maps where I explore ideas visually with others. Over the weekend, I was reading an article in the New York Times about Design Thinking and health. I realized my book, to a large degree, is a way to design ideas to reveal both gaps and strengths. The mind map below, based on that article, was created in Mind Mup, one of my new favorite mind mapping tools. To fully experience the map (and Mind Mup), click the nodes to expand and fold the branches. However, for a TOTALLY DIFFERENT experience, contact me to grant you editing privileges. My goal is for a community of mind mappers, educators and experimenters in design thinking to add to the map. I want it to be a collaborative forum for idea sharing. This is my first foray into Collaborative Mind Mapping with Mind Mup, and I hope you take the journey with me.